Srinagar, September 02 (KNO) : Run for peace-2018, Kashmir marathon organized by Jammu and Kashmir Police was flagged off by Director General of Police Dr. S.P Vaid at a colorful ceremony held near Lake View Environmental Park here today morning. Shri K. Vijay Kumar, Advisor to Hon’ble Governor who was the chief guest at the presentation ceremony distributed trophies and cash prizes among winners in different categories of the event. Shri K. B. Agarwal, Financial Commissioner, ADsGP, Shri B. Srinivas, Shri A.K Choudhary, Shri Muneer Khan. IGsP, Shri S.A Watali, Shri J.P Singh, Shri Surinder Gupta, Shri Anand Jain, Sh S. P Pani, Sh Basant Rath, SSP Srinagar and all Kashmir based commandants and a galaxy of senior police, civil, CAPFs officers, besides friends, relatives of participants and a huge gathering of sports lovers were present on the occasion. Speaking at the closing ceremony DGP conveyed heartfelt gratitude to Advisor to Hon’ble Governor of J&K for gracing the ceremony. He thanked all the dignitaries, guests and participants for making the event a grand success. DGP congratulated winners and said that he is confident that those who could not make it to the winning stand would excel in times to come through more hard work and practice adding that Bhanu Pratap Singh is an example who emerged bronze medal winner in recently held Asian Games at Jakarta, Indonesia which he said is honour for all of us. He wished more Youth from JK state would emerge medalists in Asian, Olympic games in future. 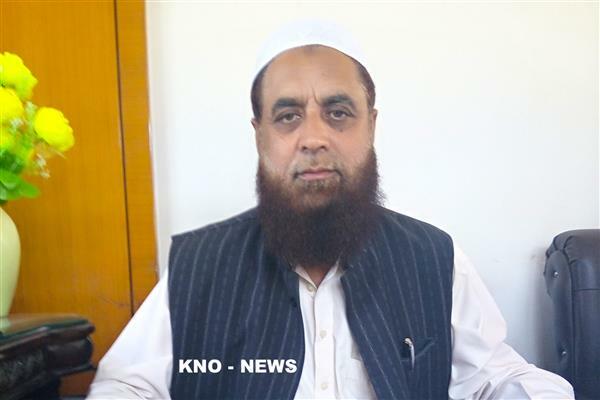 Dr. Vaid further said that unfortunately various attempts are being made to push the youth of our state towards drug addiction, unlawful activities and disruption and added that organizing such events is an endeavour of Jammu and Kashmir police to channelize the energy of youth towards positive activities. 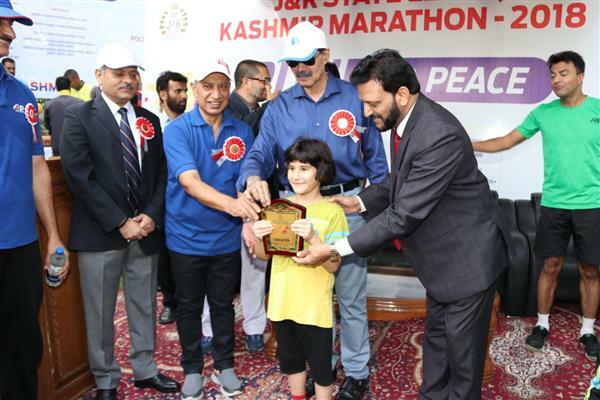 The Run for peace-2018, Kashmir marathon was organized by Jammu and Kashmir Police under its Civic Action Program. For maximum participation of public, the event was divided into five different categories based on distance to be covered by the athletes which include Full Marathon of 42 km for men, Half Marathon of 21 km for both men and women (to be flagged off separately), 8 km run for under-14 boys, 6 km run for under-14 girls, Run for Fun of 4 km for both men and women irrespective of age. In 42 Kilometers Men (Full Maratthon), first five positions were bagged by Muneer Ahmad Dar son of Abdul Majed Dar resident of Khanyar Srinagar, Dalvir Singh son of Vijay Singh resident of Khushalpora Jammu, Muzamil Hussain son of Mohammad Hussain resident of Alamgari Bazar Srinagar, Hamid Aziz son of Abdul Aziz resident of Hawal Srinagar and Umar Hamid son of Ab Hamid Dar resident of Khanyar Srinagar respectively. In 21 Kilometers Men (Half Marathon), Balwinder Singh son of Jagdar Singh resident of Mishriwala Jammu, Majid Ashraf son of Mohd Ashraf resident o Pulwama, Nisar Ahmad son of Ali Mohd Dar resident of Arahama Ganderbal, Ifshan Ahmad son of Abdul Gani Ganie resident of Check Kawoosa and Ubaib Gulzar son of Gulzar Ahmad from GDC Anantnag bagged first five positions respectively. Similarly, in 21 Kilometers Women (Half Marathon), Insha Wado daughter of Ab Rashid Wadoo resident o Rainawari Srinagar, Mandeep Kour daughter of Sardar Tarloki resident of Jammu, Yaksoona Bano daughter of Gh Mohammad Bhat, Rubab Ali daughter of Faheem Ali resident of Brain Nishat and Saima Nazir daughter of Nazir Ahmad resident of Eidgah Srinagar bagged first five positions. In 8 Kilometers Boys under 14, first 10 positions were bagged by Sheikh Saquiul sonf of Abdul Rahim from Holy Mission Narbal, Gulbadan Hikmatyar son of Syed Mohd Yaseen resident of Ganderbal, Momis Isamil son of Mohd Ismail resident of Check Kawoosa, Shakeel Ahmad son of Mehraj-ud-Din resident o Check Kawoosa, Basharat Mir son of Ab Ahad Mir from Burn Hall School,Sahil Kuttay son of Habib-ul-Lah resident of Verinag Anantnag, Aqib Ahmad Gojri son of Gh. Mohd resident of Check Kawoosa, Pavneet Singh son of Karnail Singh from St. Joseph School, Mohd Saleem Ganie son of Gh Mohd resident of Check Kawoosa and Musadiq Majeed son of Ab. Majeed Dar resident of Sheikhpora. In 8 kilometers Girls under 14, first 10 positions were bagged by Sara Naqash daughter of Mohd Ibrahim from New Convent Gogji Bagh Srinagar, Tabish jan daughter of Gulzar Ahmad Yatoo resident of Lati Mohalla Dal Srinagar, Saima daughter of Ab Gani Bhat resident of Bagat Mohalla Sibugh, Shabnum Gulzar daughter of Gulzar Ahmad resident of Lati Mohalla Dal Srinagar, Behjat Amin daughter of Mohd Amin from Tiny hearts School Srinagar, Kaifa Shah daughter of Shabir Ahmad from presentation Convenient School Sgr, Ayeeisa daughter of Rayees Chesti from Tiny Hearts School Sgr, Ansa daughter of Rayees Chesti from Tiny Hearts School Sgr, Harman Preet daughter of Kanail Singh from St. Joseph School Baramulla and Simran Manzoor daughter of Manzoor Ahmad from KMP Burzahama Sgr. A total of Rupees 4.00 lac was presented among these winners in different categories.